The Ordination Credential is acknowledgment of your ordination, imprinted with your name, ordination date and signature of a church officer. 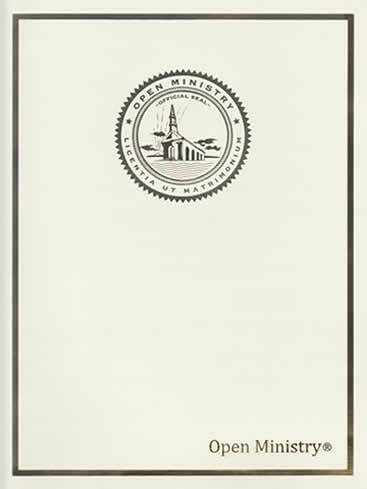 Included is our gold embossed Ministry Seal. The Certificate of Ordination is a decorative physical copy of your Credentials of Ministry and a beautiful long lasting certificate to treasure for life. NOTE: Most states will require credentials to register as a marriage Officiant. Credentials are printed on high quality traditional parchment enhanced with gold foil braided border, metallic ink flowering and starburst design in center. Suitable for framing and display. 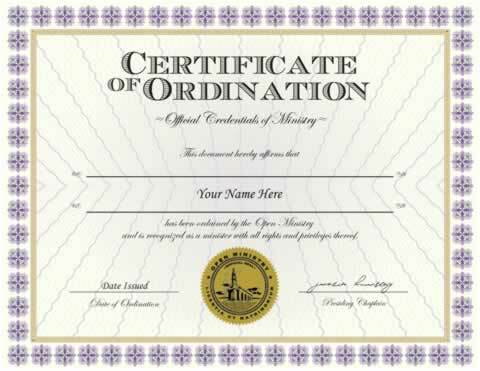 Ordination Credential is also included in some of our packages. Love it thank you! Fast Shipping, arrived as expected in just 5 days. Sweet, now i can marry the !!!!! God Bless America!